Dozens of marketers share the data behind their average session duration as well as the strategies that work for improving it. There are tons of metrics that marketers track from Google Analytics in order to measure website engagement. Bounce rate. Pageviews. New vs. returning users. Goal completions. The list goes on. So where does something like average session duration fall in terms of importance? Like bounce rate, average session duration is one of those signals based on merit, meaning it’s hard to game it. You can’t improve it by advertising, or by stuffing more keywords on your page, or by writing more click-baity headlines. Before we dive into that, we first wanted to ask marketers what their current average session duration is in order to act as a benchmark for the rest of us. According to our research, 41% of marketers say that their average session duration is between 2-3 minutes. 55% reported an average session duration greater than 3 minutes, and 27% reported greater than 4 minutes. Now, determining whether a specific average session duration is “good” is dependent on many factors, most being unique to the business and its website. So, to dive deeper, we asked dozens of marketers to share what works in terms of influencing and improving their website’s average session duration. Editor’s note: Go deeper by tracking your average session duration by channel to see which campaigns and initiatives are driving more engaged website visitors. 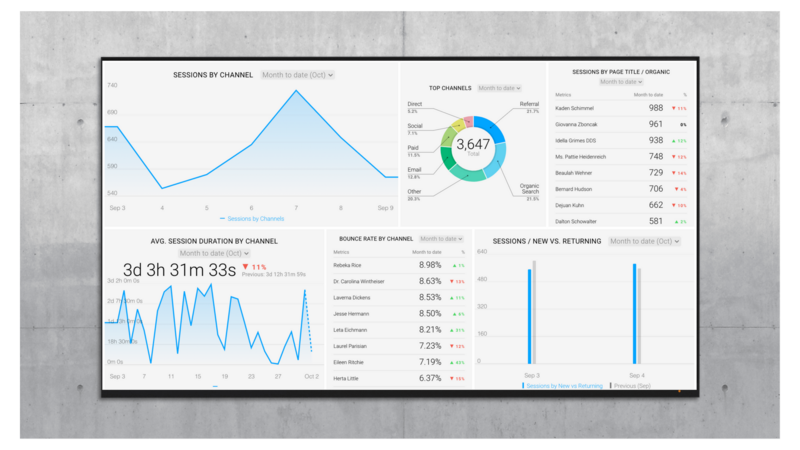 Grab the free template and visualize your data in minutes. By far the most common answer to “What’s the single best tactic to increase average session duration?” was to include visuals on your page. “Populate your posts with relevant videos, charts, and infographics to dramatically increase the time people spend on the page,” says Jose Angelo Gallegos, freelance content marketer. All these types of visuals can be useful in grabbing people’s attention and increasing session duration. Jimmy Chan of Pixelicious had an average time-on-page of 30–60 seconds on his homepage. After adding video, it jumped to over 3 minutes, a 300%+ increase. Blake Aylott saw an over-100% increase in time-on-page for Shape & Skin Medical‘s homepage. Two marketers also emphasized the importance of how you start and end your videos. So you should start by reviewing the value of the video. How should you end? Video isn’t the only way to add visual interest to your page. “One effective tactic to increase the average session time on your website is to have high-quality images between the content,” says Chetna Singla, SEO executive at Grazitti Interactive. These images make the content more engaging, she adds. What are your customers looking for? What stage of the funnel are they in? What will help them move to the next stage? The answers to these questions will help you boost your session duration. “[W]hen we’re creating and publishing a new article, we think about where it fits in the typical user journey—is it top of the funnel content, or designed to convert returning visitors?” says Nelson Jordan, co-founder of Agency Match. “That information dictates which path we try and steer our users to next. Taking this approach has increased our time on site by close to 20% so far,” Jordan adds. “One of the best ways to increase average session duration is to truly understand your customers’ path to purchase,” says Jennifer Lux, growth strategist at LyntonWeb. Users need obvious next steps, she says. In-line calls to action, slide-ins, pop-ups, and exit-intent offers at the right stage of the buyer’s journey will improve your session duration. So how do you know where your customers are in the buying cycle? How clean is your user interface (UI)? If it’s not clear and easy to use, your visitors might leave your site fast. There are all sorts of distractions you can remove, says UNINCORPORATED founder Ian Evenstar. Revling also suggests testing a simple landing page against a longer-form landing page with the same messaging. If the simpler page performs better, you’ll have a sign that your site may be too complicated. Your UI and visuals should make it easy for visitors to read your content. But so should the content itself. It’s a simple recipe, but effective. You can also write an overview of what the reader will learn on the page, says Blair McKee, marketing manager at Constellix. He also recommends a linked table of contents at the top of the page. Focusing on generating interest first, then provide the details—and your session duration will benefit. You might not think about links as an important part of increasing session duration. But several marketers told us that they are. Even just making sure to provide internal links can make a difference. Since Fisher Unitech started using more internal links, their average session duration has increased by 10%, says digital marketing specialist Jackie Tihanyi. “Take a look at some popular websites and notice their interlinking strategy, how they link enticing words that make you want to click on them,” says Laura Cabrera, Outcry.io co-founder. Use this information to inform your own linking strategy. The idea runs counter to some of the other advice we heard, but it’s a tactic worth trying out. Lauren Gilmore of PR&Prose had another piece of strategic advice: make sure every link opens in a new window. You can use all the session-duration-increasing tactics you want, but if your content isn’t worth reading, they’re not going to help. In the end, interesting and engaging content is what keeps people on the page. “If you want to keep people on your website longer, you need to make sure you are satisfying your readers,” says Donna Duncan, owner of B-SeenOnTop. This strategy not only increases your average session duration but also earns you repeat visits, she says. provided a checklist as a content upgrade. With those four steps, the took the average session duration on that post from 28 seconds to over 1:47. That’s a big jump. DWR increased its average session duration across its entire website by 55% with similar ideas. Instead of adding media and content upgrades, though, DWR focused on their text content. “In improving text content we use following rules: original content, accurate, engaging, informative, providing answers to the users short as possible and concise,” says managing partner Dario Sipos. He also noted that keeping content up-to-date is very important as well. Derek Gleason, content lead at Conversion XL, gave some great advice. “The content marketing agency Animalz has a great analogy: create libraries, not publications,” he says. “[A] hub-and-spoke model that identifies a relevant, high-level topic then builds out articles on all related topics.” These libraries, says Gleason, prove to your readers that you have expertise and supply related information to keep them reading. Whether you decide to use this model or not, you’ll need to provide readers with something valuable and worth their time. That’s what gets people to stick around. Have you tried to increase your average session duration? Which tactics did you try? Did they work? Share your thoughts in the comments below.